Mil-Rite , available in 12 colors, was continuously built in our factory since 1963. Ideally suited for your family. This UL approved, 43 RPM, 1/4HP, 60Hz, 115 Volt rated machine is supplied with a three core grounded electrical cord. It is also available in 220 VAC, 50HZ. 220 VAC motors that are suitable for Mexico, Australia, New Zealand, Europe and many other countries. It's internal precision ground gears operate at a whisper of sound inside a all metal transmission. 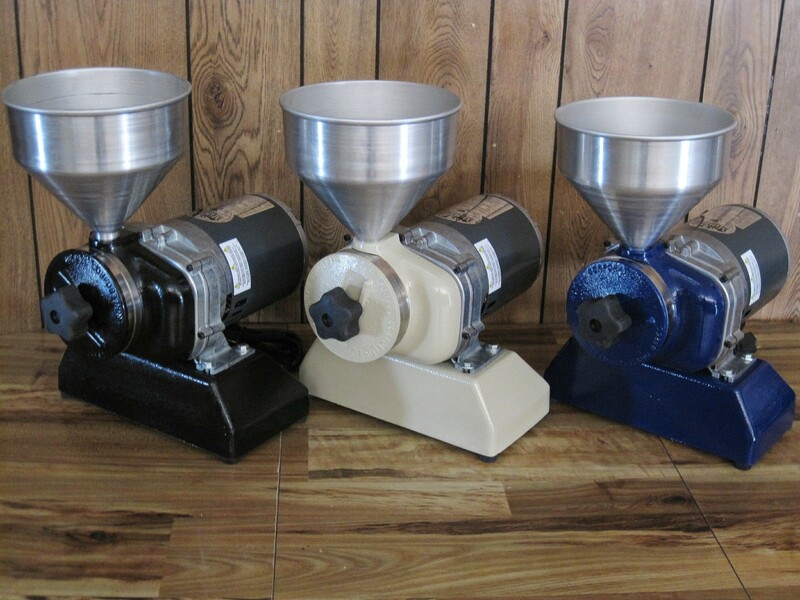 Because of this expensive and patented design, the Mil-rite is the most powerful, durable and the most quietest grain mill on the market today. It will crush and pulverize essentially any combination grains or seeds smaller than 1/2 inch diameter. The grinding heads will disengage when left unattended or when all grain is used up. Mil-rite is pre-lubricated and designed for at least 20 years of trouble-free operation with minimum of maintenance required. 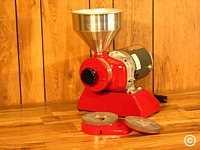 With just a turn of the adjustment knob, the milling grade is completely adjustable from fine flour to course cereal. 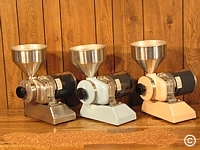 The self cleaning stones or steel wheels produce .5 to 1.5 cups of fine flour per minute. Coarse grinding is much faster. 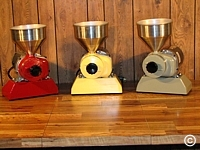 A standard 3-quart seed hopper is included. Other sizes of hoppers are available upon request. Powder coated steel handle (Part 18H) for manual operation may be purchased separately and can be used in the event of a power outage or in remote locations. This model comes standard with the stone grinding wheels. An optional stainless steel attachment may also be purchased at a later time. Stainless steel grinding wheels will grind many grains or seeds that will either plug up the stones or otherwise will not grind successfully using conventional high speed mills. 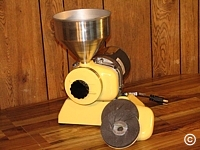 Stainless steel wheels will effectively grind small nuts, berries, soybeans, field corn (not popcorn) and many other difficult to grind grains. Please read the FAQ for additional information. The 10-year limited manufacturer's warranty covers all parts and labor, (excludes shipping costs) to the original purchaser only. Free literature(owners manual) and live technical support for the duration of the warranty period. A two way electrical switch is available for this unit. The two way switch is a additional feature specially factory installed (cost of $79.95)inside the motor. It allows you to micro adjust the machine for very fine setting. Please read our warranty specifics on our home page. Dimensions: 16" high, 11" wide, 12" deep. Grinding wheel diameter is 5". Operating manual is included. Shipping weight is 37 pounds. A 30 day return policy applies on if not 100% satisfied. A 7% discount applies if paid with a check or money order. All Mil-rites will be shipped within two to three weeks depending on the color you select. Gift certificates are available upon request.